And to meet the physical needs of the community, we’re raising money to dig and construct a cistern for drinking water–something that most of us take for granted every day. Much of the drinking water on the Island comes from public wells or the collection of water from roofs. 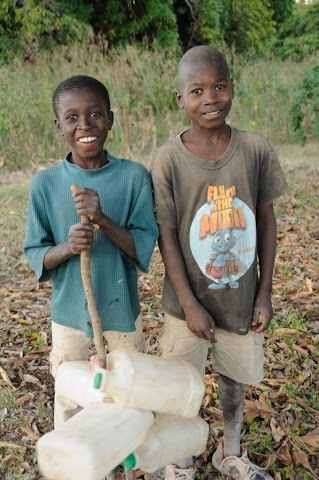 I saw one of the public wells near the cow pasture converted to soccer field when I visited a year and a half ago and I photographed these two smiling boys who were bringing water from the well to take home to their family. 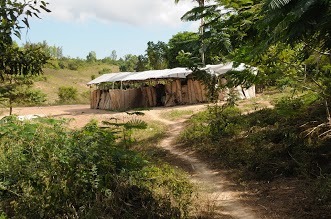 Because of everyone’s generous donations in last year’s run, we were able to build a new 5 room School with a nice large roof to collect water from! The spiritual and physical needs for the village of Bel Vie on the Island of LaGonave Haiti are great so we very much appreciate your interest and financial support of our event!